33181 Wing Commander John Chilton Archer of the RAF. VR, 407 Squadron. Son of Group Capt J. Archer CBE and Mrs E. Archer. Born in Sidmouth in the September Quarter of 1917. Died 27 September 1943 aged 26. EX/507 Marine Oliver Bagwell of the Royal Marines, H.M.S. Fleetwood. Son of Robert and Anne Bagwell of Sidmouth. Born in Sidmouth in the September Quarter of 1918. Died 30 April 1940 aged 21. 567431 Sgt Edward Alexander Bailey of the RAF, 205 Squadron. Son of John and Louisa Bailey of Sidmouth. Born in Wandsworth in the September Quarter of 1919. Died 7 December 1941 aged 22. D/J 41049 Ordinary Seaman Leslie George Bastin of the Royal Navy, HMS Rotherham. Husband of Nellie Bastin of Sidmouth. Born in Sidmouth in the September quarter of 1923. Died 6 March 1943 aged 19. D/J41049 Petty Officer Bernard John James Blake of the Royal Navy, HMS Rawalpindi. Husband of Mary Blake of Sidmouth. Born in Southampton in the March quarter of 1899. Died 23 November 1939 aged 40. 753 8784 Cpl Francis Reginald Boyce of the Army Dental Corps. Son of Arthur and Louise Boyce of Sidmouth; brother of Leicester Boyce (below). Born in Barnet in the September quarter of 1917. Died 10 November 1944 aged 27. D/MX 574117 Supply Assistant Leicester John Boyce of the Royal Navy, H.M.S Charybdis. Son of Arthur and Louise Boyce of Sidmouth; brother of Francis Boyce (above). Born in Barnet in the December quarter of 1906. Died 23 October 1943 aged 37. 141 1646 Cpl John Coventon Broom of the RAF VR. Son of Alfred and Alice Broom; husband of Lilian Broom of Sidford. Born in Sidford in the December quarter of 1919. Died 4 October 1944 aged 24. 903229 Leading Aircraftman Reginald Victor Brown of the RAF VR. Son of Bigwood and Elizabeth Brown of Sidmouth. Born in 1915. Died 27 May 1940 aged 25. 7591185 Private Wilfred John Brown of the 44th Division, the Royal Army Ordnance Corps. Son of John and Winifred Brown; husband of Isabella Brown of Sidmouth. Born in Westbury on Severn in 1903. Died 12 July 1941 aged 38. Buried in Sidmouth Cemetery. LT/JX 228089 Ordinary Seaman Donald Charles Channing of the Royal Naval Patrol Service, HMS Ormonde. Son of George and Ada Channing of Sidmouth. Born in Sidmouth in 1921. Died 16 February 1941 aged 19. Buried in Sidmouth cemetery. 6457803 Cpl Eric Coleborne of the 1st Battalion, the Royal Fusiliers. Son of Charles and Ellen Coleborne. Born in Sidmouth in 1913. Died 26 February 1941 aged 28. Caps D/J. X214281 Coder Conrad Stewart Daniell of the Royal Navy, HMS Sudacity. Son of Samuel and Eva Daniell of Sidmouth; husband of Ena Mary Daniell of Sidmouth. Born in Sidmouth in the December quarter of 1911. Died 27 December 1941 aged 30. Lieut Geoffrey Bowcher Davie of the Royal Navy Volunteer Reserve, HMS Formidable. Son of Mervyn and Evelyn Davie of Sidmouth. Born in Kingston upon Thames in the June quarter of 1911. Died 8 May 1941 aged 29. Is D/JX 160658 Telegraphist John Harden of the Royal Navy, HMS Gloucester. Son of Henry and Gwendolyn Harden. Birth registered in St Thomas in the June quarter of 1922. Died 22 May 1941 aged 19., Commemorated on the Memorial at Plymouth. 14299649. Trooper Cecil Kenneth William Harris of the 15th/19th Kings Royal Hussars, the Royal Armoured Corps. Son of Cecil and Emily Harris. Born in Sidmouth in the March quarter of 1924. Died 24 September 1944 aged 20. 183 3348 Private Wilfred John Harris of 69 Battery, the 21st Light Ack Ack Regiment of the Royal Artillery. Son of Levi and Charlotte Harris. Born in Kidderminster, Worcestershire in 1907. Died for December 1942 aged 35. 1543616 Lance Bombardier Arthur Albert Hodge of 130 Battery, the 23rd Light Ack Ack Regiment of the Royal Artillery. Son of James and Annie Hodge; husband of Lottie Hodge of Sidmouth; father of Arthur James Hodge (below). Born in Plymouth in the December quarter of 1892. Died 22 June 1941 aged 40.. Buried in Sidmouth Cemetery. 5627736 Private Arthur James Hodge of the 1st Battalion, the Devonshire Regiment. Son of Arthur Hodge (above) and Lottie Hodge (see above). Born in Salford in the September Quarter of 1918. Died 26 November 1943 aged 28. 5620177 Private Sidney Cyril Samuel Hooper of the Army Catering Corps. Son of Mr and Mrs Sidney Hooper; husband of Und Beattie Hooper of Sidmouth. Born in Plymouth in the December Quarter of 1914. Died 4 April 1946 aged 32. Buried in Sidmouth Cemetery. 518421 Sergeant Robert James Houchin of the RAF VR, 248 Squadron. Son of Robert and Isobel Houchin. Born in Newport Pagnell in the September quarter of 1916. Died 30 January 1941 aged 24. Surgeon Lieutenant Kenneth Cole Jeffery of the Royal Navy Volunteer Reserve, HMS Partridge. Son of Surgeon Captain T. W. Jeffery and Mrs. A. M Jeffery of Sidmouth. Born in Plymouth in the September quarter of 1909. Died 18 December 1942 aged 33. He held the following qualifications: MB; BS; MRCS; LRCP (London). He was awarded the DSC. Ordinary Seaman Cyril William Langmead of the Merchant Navy, SS Laertes. Son of Arthur and Lucy Langmead of Sidmouth. Born in Sidmouth in the March Quarter of 1925. Died 3 May 1942 aged 16. Laertes was torpedoed by U. 109. 18 crew died out of a total of 66. D/JX 1638411 Able Seaman William George Liverton of the Royal Navy, HMS Charybdis. Son of William and Maria of Exeter; husband of Gladys Liverton of Sidmouth. Born in Kenn in 1900. Died 23 October 1943 aged 43. Lieutenant Aubrey Richard Moore of the Royal Navy, HMS Zulu. Son of Captain Aubrey Moore and his wife Ellen Moore. Born in Sidmouth in the December Quarter of 1916. Died 14 September 1942 aged 25. Yeoman of Signals William Arthur Morrish of the Royal Navy, HMS Clacton. Son of Arthur and Gertrude Morrish of Sidmouth. Born in Sidmouth in the December Quarter of 1914. Died 31 December 1943 aged 29. 2nd officer Frederick Newbery of the Merchant Navy, SS Arthur F. Corwin. Son of William and Ethel Newbery; brother of Peter (below). Born in Holborn, London in 1916. Died 13 February 1941 aged 25.The Arthur Corwin, carrying a cargo of aviation fuel, was lost with all hands - the cause of her sinking is still not known. Sub-Lieutenant Peter Ralph Newbery of the Royal Navy Volunteer Reserve, HMS Landrail. Son of William and Ethel Newbery; brother of Frederick (above). Born in West Ham in 1921. Died 6 January 1945 aged 24. 4626401 Private John Pratt of the 1st Battalion, the Duke of Wellington's (West Riding) Regiment. Son of Mr and Mrs E. J. Pratt of Sidmouth. Born in Sidmouth in the March Quarter of 1920. Died 21 April 1943 aged 23. D/K 569 16 Stoker 1st Class Bertram Harry Pratt of the Royal Navy, HMS Boscawen, a naval training ship. Son of Henry and Harriet Pratt. Born in Sidmouth 12 November 1892. Died 21 April 1941 aged 49. Buried in Weston Mill Cemetery, Plymouth. T/171225 Sergeant Albert Harry Prowse of the Royal Army Service Corps. Son of Arthur and Mabel Prowse of Sidmouth; husband of Margaret Prowse of Sidmouth. 5620784 Lance Corporal (Alfred) Charles Prowse of the 4th Special Battalion, the Devonshire Regiment. Son of Arthur and Mabel Prowse of Sidmouth; brother of Albert (above). Born in Sidmouth in the December Quarter of 1920. Died 12 June 1941 aged 20. D/MX 89295 Petty Officer Stoker Edmund Frank John Purchase of the Royal Navy, HMS Charybdis. Son of Ethel and Stepson of James F. Horn of Sidmouth. Born in Sidmouth in the march Quarter of 1915. Died 23 October 1943 aged 30. 979531 Officer Cadet Mile Rathmell. Son of Bernard and Marjorie Rathmell. Born in Wallasey, Cheshire in 1910. Died 6 April 1943 aged 33. He held the following qualifications: B. Arch; ARIBA. D/JX 132235 Petty Officer Henry Francis Rowland of the Royal Navy, HMS Drake (Shorebas). Son of Frank and Ada Rowland of Sidmouth; husband of Doris Rowland of Sidmouth. Bornn in Sidmouth in the September Quarter of 1912. Died 21 April 1941 aged 28 when the Shorebase was bombed. Buried in Weston Mill Cemetery, Plymouth. 86071 Sergeant Frederick Hobbs Salter of the 5th Searchlight Regiment, the Royal Artillery. Son of Albert and Annie Salter of Sidnmouth. Born in Sidmouth in the December Quarter of 1919. Died 23 October 1943 aged 23. 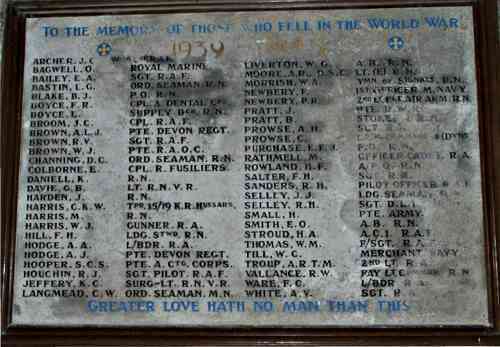 41478 Pilot Officer Richard Heron Sanders of the RAF, 220 Squadron. Son of Sidney and Gladys Sanders of Sidmouth. Born in Sidmouth in the June Quarter of 1920. Died 24 April 1940 aged 19. D/J 114915 Leading Seaman John James Selley of the Royal Navy, HMS Ardent. Son of Henry and Emily Selley; husband of Violet Selley of Sidford; brother of Richard (below). Born in 1Helston in 1910. Died 8 June 1940 aged 30. 5435233 Sergeant Richard Henry Selley of the Durham Light Infantry. Son of Henry and Emily Selley; husbandm of Muriel Selley; brother of John (above). Born in 1911. Died 19 June 1944 aged 33. 13099624 Private Harry Small of the Pioneer Corps. Son of John and Mary Ann Small; husband of Edith Small of Sidmouth. Born in Aylesbeare in 1904. Died 11 April 1945 aged 41. A BOAC fitter working on loan to the RAF. Husband of Elsie Stroud of Sidmouth. Born in Uxbridge in the September quarter of 1909. Born in Chetnole, Dorset in 1906 . Died 7 December 1942 aged 36. 1356860 Flight Sergeant (Air Bomber) Walter Mervyn Thomas of the RAF VR, 101 Squadron. Son of Albert and Winifred Thomas; husband of Mildred Thomas of Sidford. Born in Torrington in the March Quarter of 1921. Died 5 October 1944 aged 24. First Radio Officer William Charles Till of the merchant Navy, SS Somme. Son of Charles and Alice Till; husband of Mabel Till of Sidmouth. Born in Clapham, London in 1901. Died 16 February 1942 aged 41. 2nd Lieutenant Alexander Robert Talbot Troup of the 19th Field Regiment, the Royal Artillery. Son of Brigadier Francis Charles Troup and his wife Mabel. Born in 1924. Died 13 April 1943 aged 19. Paymaster Lieutenant Commander William Roger Vallance of the Royal Navy, HMS Cornwall. Son of George and Violet Vallance. Born in Sidmouth in the December quarter of 1909. Died 5 April 1942 aged 34 when his ship sank after an attack. 5619066 Lance Bombardier Frederick Charles Ware of 257 Battery, 65 Field Regiment, the Royal Artillery. Son of John and Lilian Ware of Sidmouth; husband of Kathleen Ware of Sidmouth. Born in Sidmouth in the December quarter of 1919. Died 8 November 1943 aged 24. 918707 Sergt. Arthur Vernon White of 301 Field Regiment, the East Africn Artillery. Son of William and Louise White; husband of Lily Alice White of Lancashire. Born in Sidmouth in the December quarter of 1916. Died 12 February 1944 aged 27.